Roscoe is almost ten months old, and I have officially commenced planning for his one year birthday party! I will not spoil the fun for party guests by sharing all the goodies, but just know there's gonna be a lot of monkeying around! 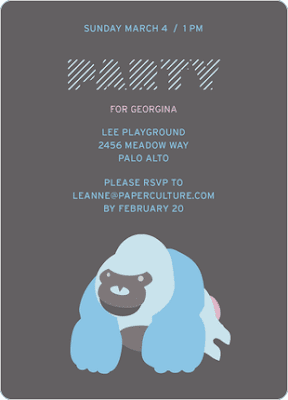 Paper Culture offers such a great collection of cool, funky, and fresh invitations. You must check them out!